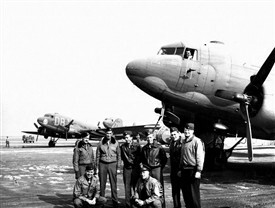 Welcome to the RAF Balderton research group page. The group was formed in February 2016 by myself and Leighton Topham along with his partner Debbie Taylor after I started a face book page, since then the group as grown with the addition of Ashley Irons, Shaun Noble, Colin Saville and Jackie Hall. We have just released a DVD compiled for us by Ashley and we have a book due later this year or early 2017 written by Colin who has already written the history of RAF Winthorpe and Newark Air Museum. 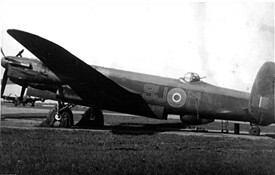 RAF Balderton opened in June 1941 with grass runways over hard clay and used as a satellite airfield for RAF Finningley with 25 Operational training Unit flying the Handley Page Hampdens, Then in December 1941 408 (Goose) Squadron Royal Canadian Air Force moved from RAF Syerston again flying the Hampden. 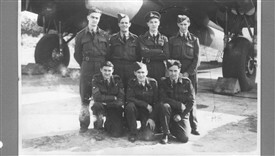 Their first operational flight from RAF Balderton was on the 10th December 1941 and was a daylight bombing raid on the airfield at Leeuwarden. 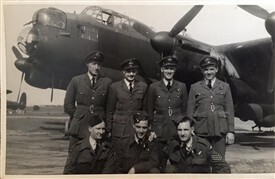 They remained at Balderton until the 15th September 1942, during this time they flew 1022 operational sorties and lost 38 aircraft and 136 aircrew. 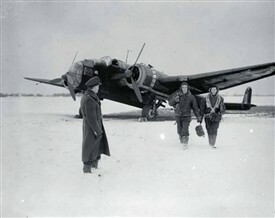 The airfield closed after the departure of 408Sqd until the concrete runways were completed. After the runways were completed Sir Frank whittle arrived with the Jet Trials Unit and the locals reported seeing a funny looking aircraft with no engines flying over the area making a strange noise. 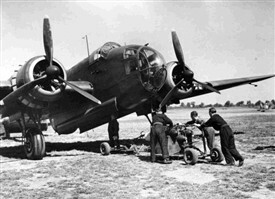 Also during the period 1668 Heavy conversion unit formed at Balderton on 15th August 1943 flying Lancaster's and the Halifax MK ll and MK V. and it was from this unit that Sir Leonard Cheshire honed his skills on the Big four engine bombers. 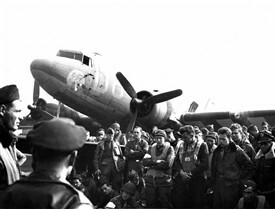 Early in 1944 the airfield was handed over to the USAAF and it became AAF Station 482 and over the period February to September 1944 the Americans operated the C47 Sky-Train along with the Waco Glider. 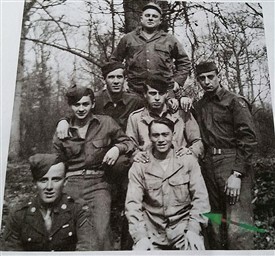 On the 17th September the first wave of C47's left Balderton loaded with paratroopers bound for Holland on Operation Market Garden. 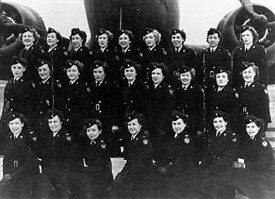 The second wave of 50 C47's towing Waco gliders left later in the day losing only one aircraft and one aircrew. 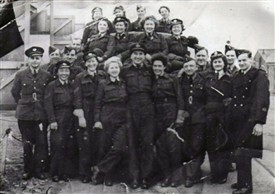 Late in September 1944 the airfield was handed back to the RAF and by the 19th October the newly formed 227Squadron RAF arrived with their Lancaster's and their first operational flight was on the 28th October with 18 aircraft on a bombing attack on Bergen. 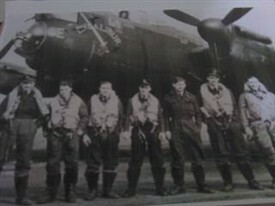 227 squadron stayed at Balderton until the 5th April 1945 and then moved to RAF Strubby During their time at RAF Balderton the Squadron flew 717 operational sorties with the loss of 14 Lancaster's and 62 aircrew. 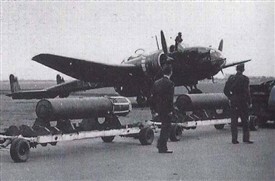 The airfield closed for operations in April 1945 and Bombs were stored on the runways until 1947. 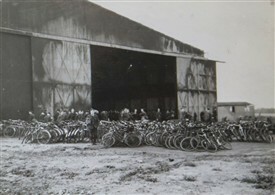 The airfield was sold in 1954. 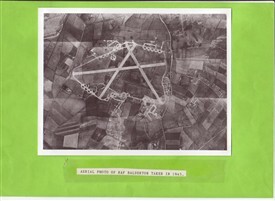 During the years that RAF Balderton was operational a total 214 Airmen and civilians lost their lives. This number is not set in stone as the research onto the airfield and the effect it had on the local community continues. 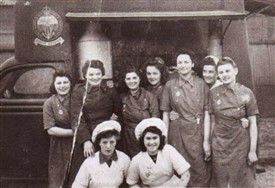 There could have been nothing more tragic when on the night of the 16th August 1941 a Handley Page Hampden of 25 OTU crashed into 3 houses on London road Balderton killing six of Mr and Mrs Brumptons children as they slept in their beds. 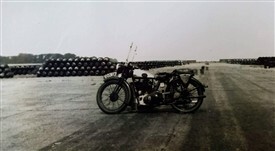 We have Displays in Balderton Library from the 13th March with a short talk at 1430 hrs till the 27th March then into Newark Library until the 21st April or you can visit our stand at Cockpit fest at Newark Air museum on the 17th and 18th June also in Newark Market place for Armed Forces day on Sunday the 25th June. This page was added by Pete Stevens on 15/02/2017.